This tour is a series of short leisurely walks, taking in the beautiful Silver Falls, the mighty Octopus Tree, the fascinating stories of the Springs and finishing with epic views from the pinnacle. A great collection of some of kunanyi’s gems. 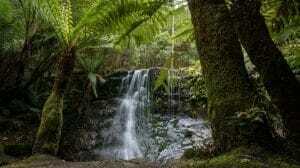 We specialise in guided day walks on kunanyi / Mt Wellington. Walk in luxury with supportive guides, take an energising break with superb Tasmanian produce and soak up one of Tasmania’s most popular destinations. Come with us for a walk on kunanyi.